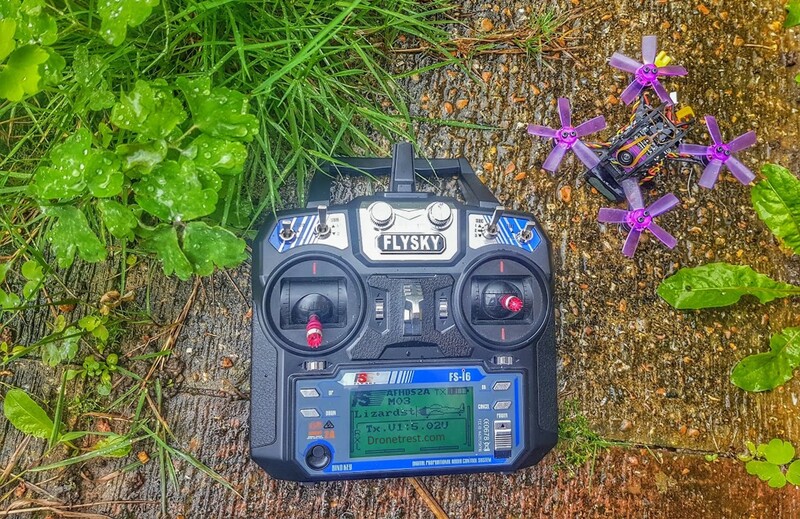 Built strong enough to handle the abuse of a beginner but still powerful enough for pros with its 3S battery, the Lizard 95 appeals to just about any FPV pilot. 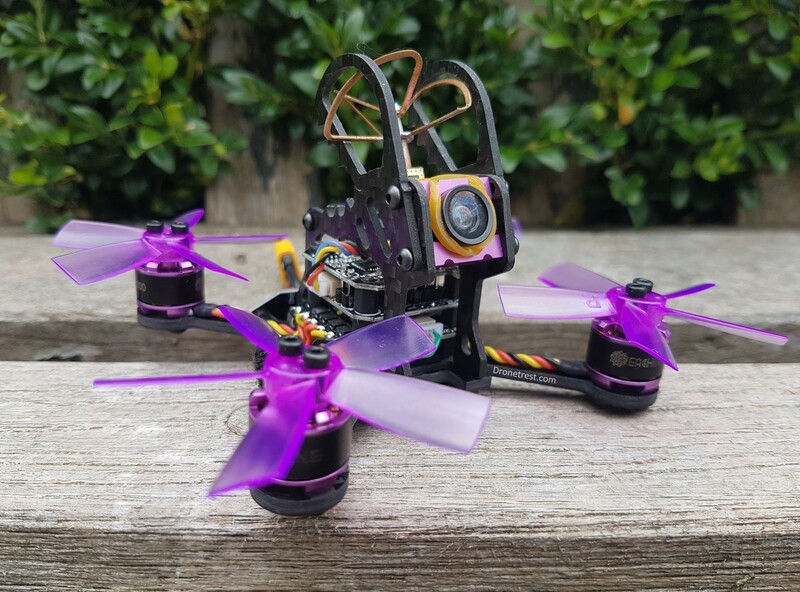 The Lizard 95 is a new release from Eachine that has been built in the likeness of the Aurora, with the same minicube flight stack featuring a Omnibus F3 and Dshot600 4in1 ESC. 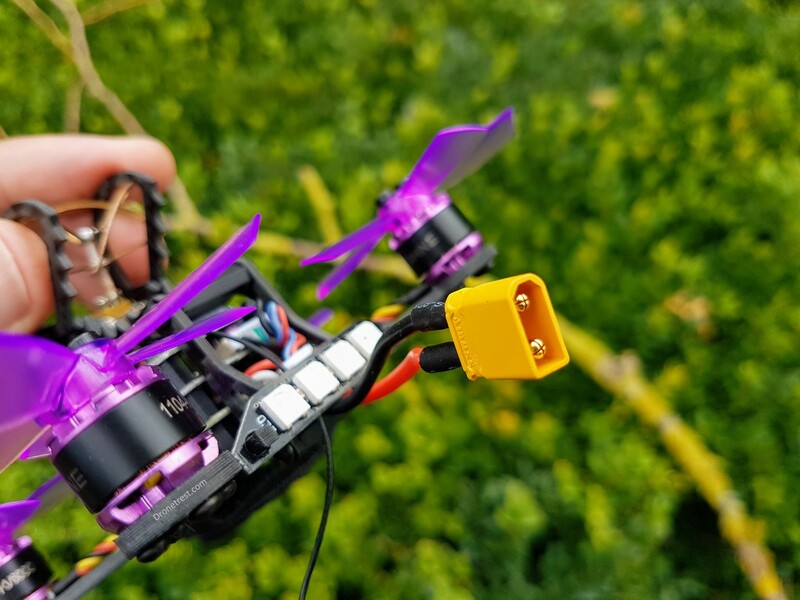 Rocking a 600TVL AIO camera with a switchable 25mw/100mw VTX and 3s compatible 1104-6000KV motors, you can expect a good FPV flying experience and at this size, you will find yourself trying to fly through gaps smaller than any you’ve ever considered before! You can buy the Lizard 95 with three different receivers: Spektrum DSM2/DSMX, FrSKy and FlySky but is it worth the money? Very durable frame and propellers with good build quality. Even the antenna is protected. XT30 connector for higher continuous amp draw (not JST like similarly sized quads). 3S battery included as stock to give great flight performance. Moderately easy to repair and replaceable components! Nice and bright RGB LED customisable on Betaflight. Loud Buzzer so you can find this tiny quad when you crash I mean land in long grass. Very detailed manual (rare), with warnings and explanations in everything from binding to configuring your VTX! Heavier than similar sized micro drones, but that is because it’s built to be strong! Not the best build quality (typical for cheaper quads). One of our motor screws was loose out of the box, and the anntea UFL connector is not clued to the FC, so that can come loose. XT30 connector is currently not that common for batteries of this size. Awkward to reach bind button. VTX gets quite hot in flight and while powered via USB! FPV camera mount can wobble if you dont secure it properly with the elasic bands. Inefficient propellers for short flight times, switch out to 4 blade props for slightly better flight times! Motors get very hot while flying, good thing the battery does not last long. RX antenna is unprotected, just sticks out the bottom! No USB port on the drone itself, so don’t lose the cable that includes a built-in USB to UART adapter. 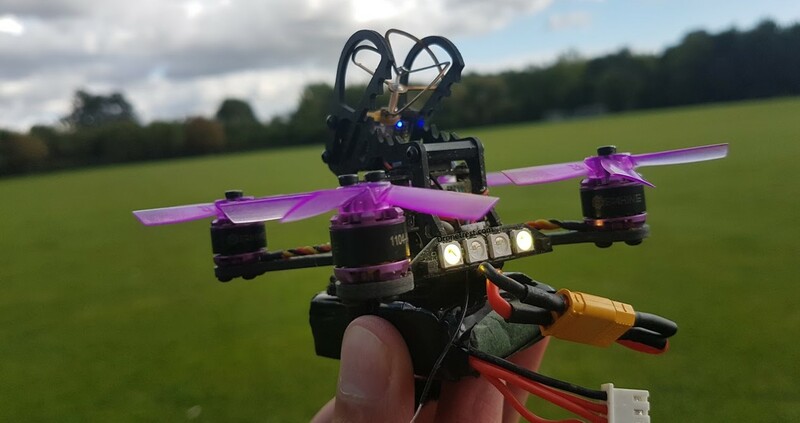 Although it’s not the fastest microquad out there, with its sleek and flashy design, the Lizard95 is more than capable of turning heads. Couple that with a strong, durable frame and we’re on to a winner. Due to the speed and durability, the Lizard is perhaps more suitable for the beginner to intermediate range but don’t let this stop if you are an experienced pilot! 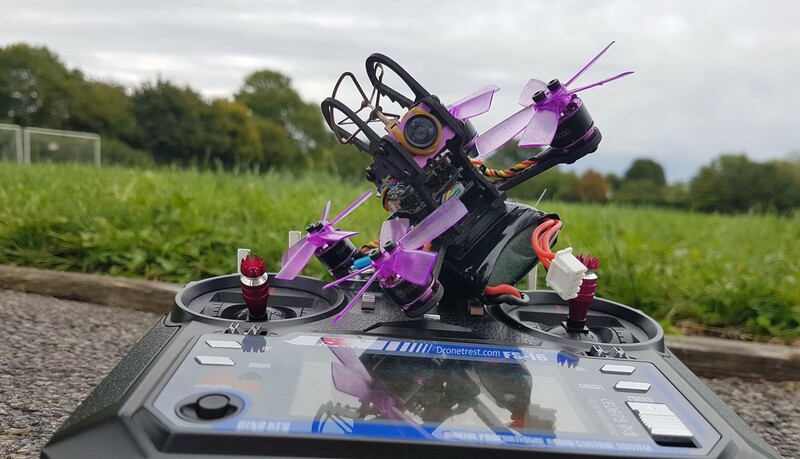 The Lizard95 still packs a punch and when in the air, this quad delivers an energetic and fun FPV experience! The Lizard95 also comes with a detailed manual, assisting beginners with any pre-flight issues. The Lizard comes with a manual (the “Quick start guide”), a USB adapter, Eachines USB to UART port, two battery/camera Velcro pack and spare props and screws for the motors. Not forgetting the Allen key and screwdriver! 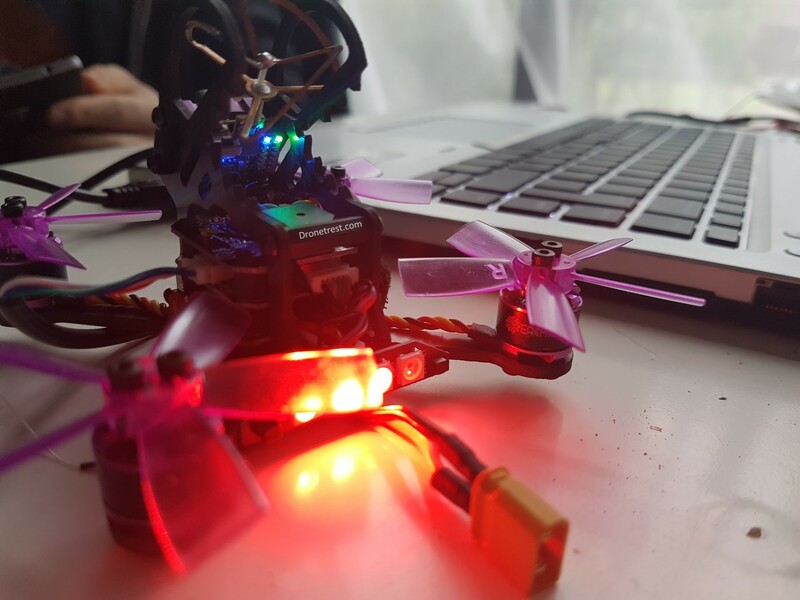 The Lizard is a fun and exciting little quadcopter, you can’t help but feel happy when flying this microquad. It performs amazingly for its size and handles very well during adverse weather (which is great news if you live in the UK! )- I was able to lap our course with ease even whilst shivering in the cold wind. Despite the Lizard’s resistance to crashes, if offers a lot of power out of the box and is able to perform tricks and flips with the stock propellers. 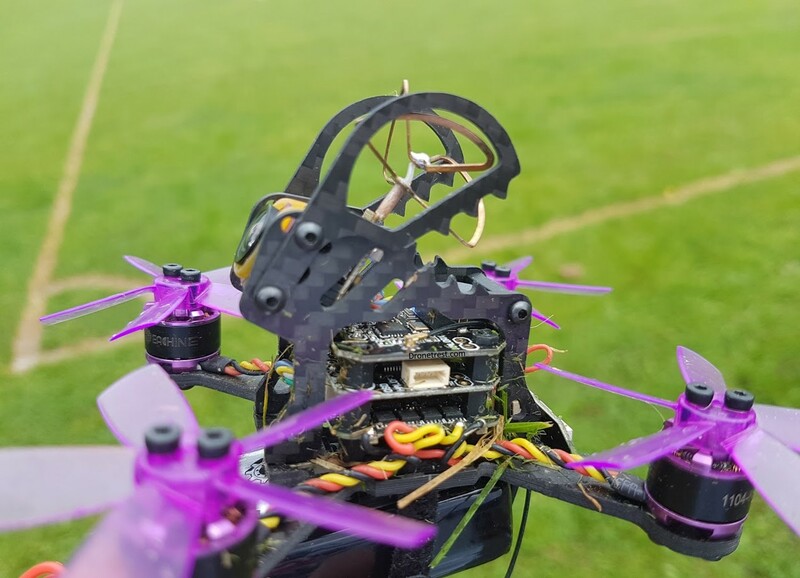 If this is your first micro quad you will not be disappointed. However, I have flown a lot of microquads, one being the seriously fast ARfun 90, and I was left wanting more from the Lizard95. 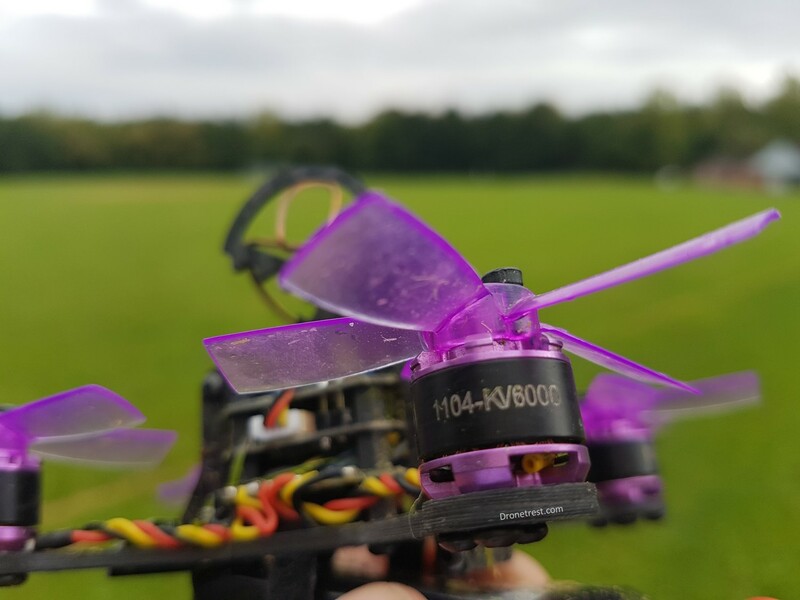 The 5-blade props kept me in the air for only 3 minutes and due to the extra weight on the frame, the Lizard has lost some power. But do bare in mind that with this extra weight, you get extra durability. The MiniCube Flight Stack is used in the Lizard95 and this comprises of the ESC, FC and PDB all neatly stacked on top of one another. The components used here are of a high quality and the flight stack really pulls the whole build together. Compatible with DShot600 – 38khz protocol, you’ll be able to take advantage of several advantaged features such as error rejection and drifting oscillation prevention (no calibration). Because the MiniCube is stackable, the whole system can be powered from the USB input. 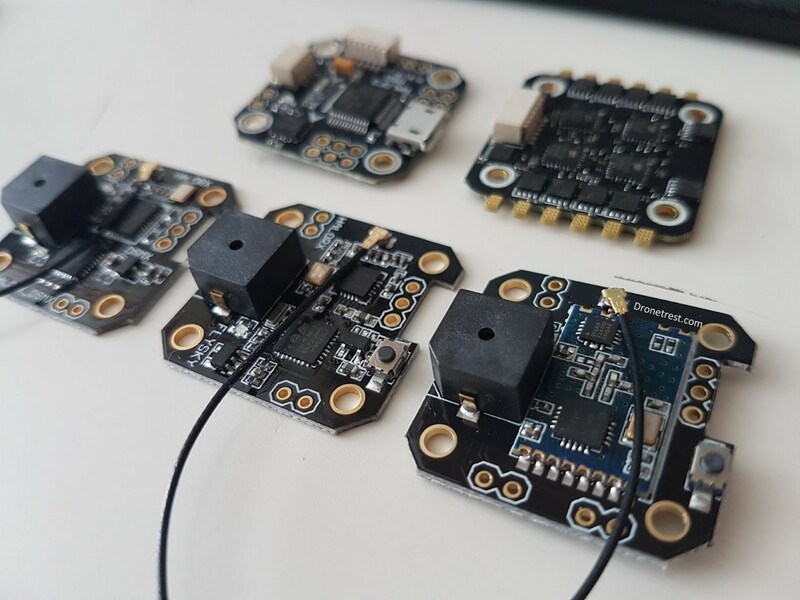 Whilst some computers might not be able to handle the power draw, those that do will let you test out your VTX, camera or OSD at the same time as configuring your board on BetaFlight! To read more about the minicube, check out the minicube manual that Alex wrote. 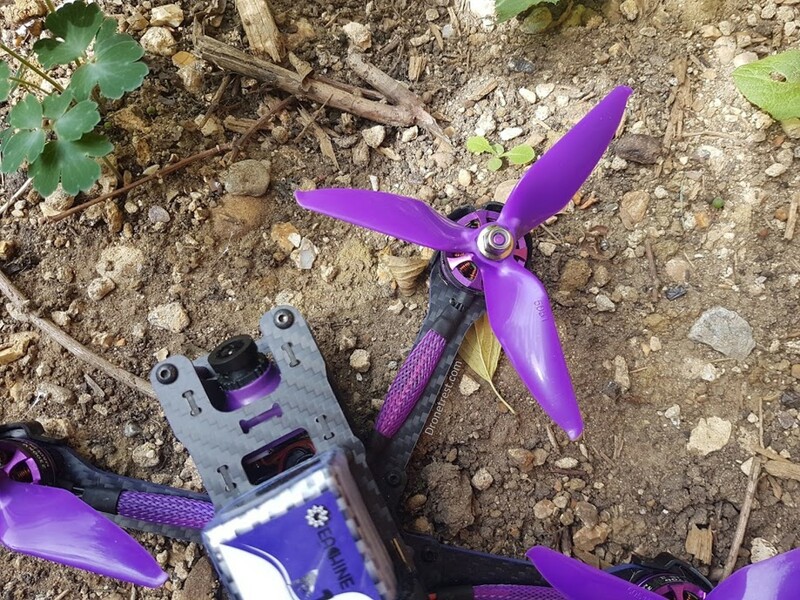 One of the more interesting decisions made by Eachine was to put 5-blade props on the Lizard and whilst cosmetically appealing, as mentioned earlier, they don’t provide much practicality for your flight times. You’d be better off switching to 4-blade propellers to increase the flight time and possible top speed! When it comes to cheap quadcopters, low build quality usually correlates with the price. Unfortunately, this Lizard is no exception. When we unpacked our review unit, one of the motor screws had fallen out, and no thread locker was used. That said, this was one of the bigger issues we had with the build and so as long as you are aware of this, and take a bit of time to check all the screws, it’s not a dealbreaker. One little niggle worth mentioning is that the Lizard95 comes with a XT30 battery connector instead of the standard JST connector. This may mean that you need to stock up on batteries and chargers with XT30 connectors but this is no bad thing. The XT30 provides you with 30 amp coverage over the 20 amps provided by the standard JST connector. And since the Lizard uses a 3S battery with 5-blade props, the quad will pull 30A on full throttle. Unfortunately, the MicroCube doesn’t come with a USB port, but Eachine has made up for this by providing a USB adapter and USB to UART cable. So you’ll be able to lose one! We’ve flown a lot of quads here at Unmanned Tech and I think we can all agree that the Lizard is pretty impractical when it comes to mounting the battery. The velcro provided doesn’t fit nicely on the frame so you’re left relying on a half stuck strip (and the battery strap of course). 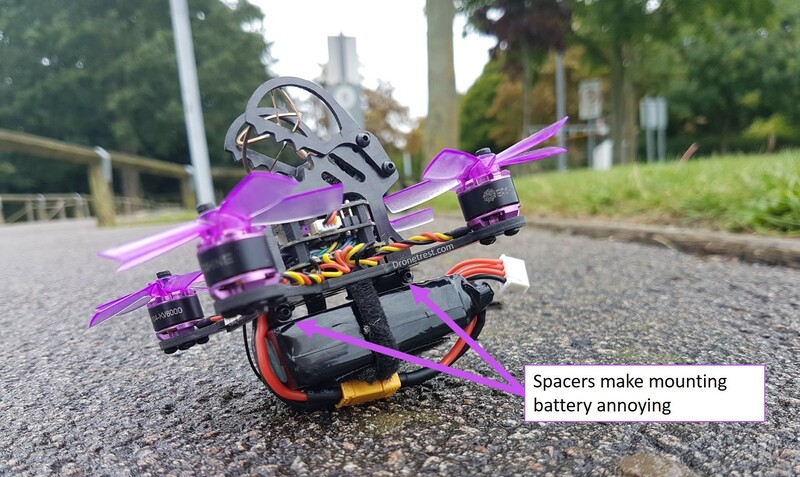 The only way around this is to stick it vertically to the quad and this seems to do the trick but you do need to keep an eye on the battery as you fly if you can. In conclusion, the advantages of the Lizard95 outweigh any negatives and I would definitely recommend this microquad to pilots of all levels. 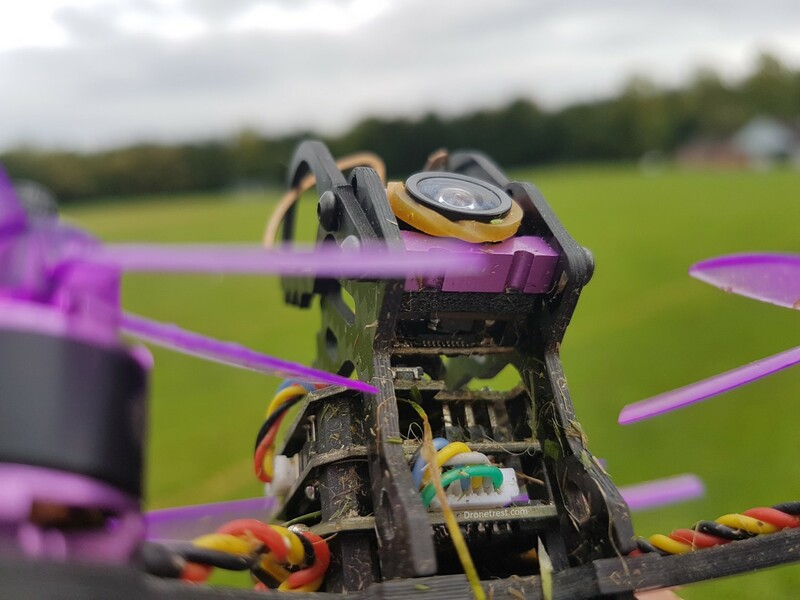 There’s a good feeling to flying the Lizard and you’ll be able to hop between trees with any other microquad on the market. To me, the Lizard felt like it had extra bounce than the standard microquad. As I dodged branches it was very locked in, and this is something I’ve not really experienced in RTF microdrones before. However, I would make small improvements to the drone if I was building it myself. This would, however, make it more expensive and value for money is, after all, what Eachine are all about.